I had a dream the other night. I won't got into details but there was a lady in the dream who was introduced as Isis-Hathor. I woke up feeling very odd and mentioned to my husband that I'd never heard of the two being joined before. A little bit of research and, lo and behold, there She is! Does anyone have any info/UPG or links on Aset-Hethert? Do you think it's important that the Greek names were used or no? I do know that that is a Greek sync. As far as I understand it doesn’t outright show up in kemetic things? So yes, Greek names may indicate its a Greek goddess in a way. I know a couple people have looked into her before. Yes! She does exist! I don't know much about Aset-Hethert historically, but She is mentioned a few times in The Ancient Egyptian Daybook by Hemet (Tamara Siuda). I have also seen Her mentioned here in the forums/conversations with other Kemetics before. I believe Aset-Hethert is mostly New Kingdom or later, but I have no source to back that up. As for UPG, a few months ago, Aset began squeezing Her way into my life. This began by Her appearing to me as Aset-Hethert (or maybe it was Hethert-Aset... it was all kind of confusing and syncs hurt my brain). Hethert has been a part of my life for many years so it made sense that Aset came to me in that way. Since then, the Aset I have been feeling has been a little more prominent... enough that it makes me feel that She might just be Aset, but also a part of me feels like it might still be Aset-Hethert. I don't really have much more to say about Her except that She is absolutely amazing. A strong, powerful being with tremendous grace, love, and compassion. And She loves divination! Edited to add: I do remember now coming across Aset-Hethert in one of my books once... if I can remember which one it was then I will come back and mention it. Aset-Hethert kinda is Isis, so using the Greek names makes sense to me. 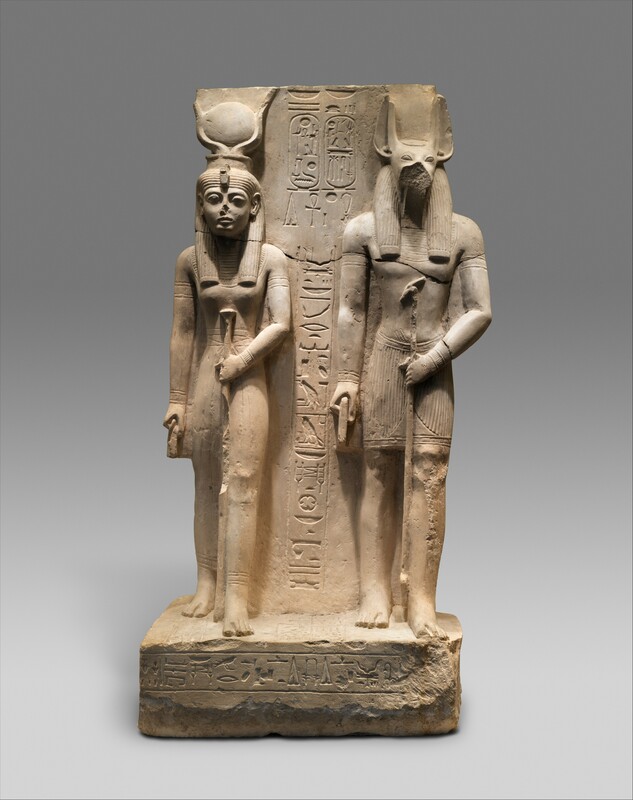 New Kingdom, Dynasty 19, reign of Ramesses II, ca. 1279–1213 B.C.E. The hieroglyphs say "Aset-Mut-Hethert". So this combination started at least as early as the 19th Dynasty. A 2-foot-long stone wall relief featuring Wepwawet, "Lord of the Two Lands" with Hethert and Seti I, son of Ra, was repatriated to Egypt in 2015, after being smuggled to the United Kingdom. It's now on display at the Sohag Museum. This relief comes from Asyut, where there is a Wepwawet temple under the streets of modern Asyut that was built by Seti I. 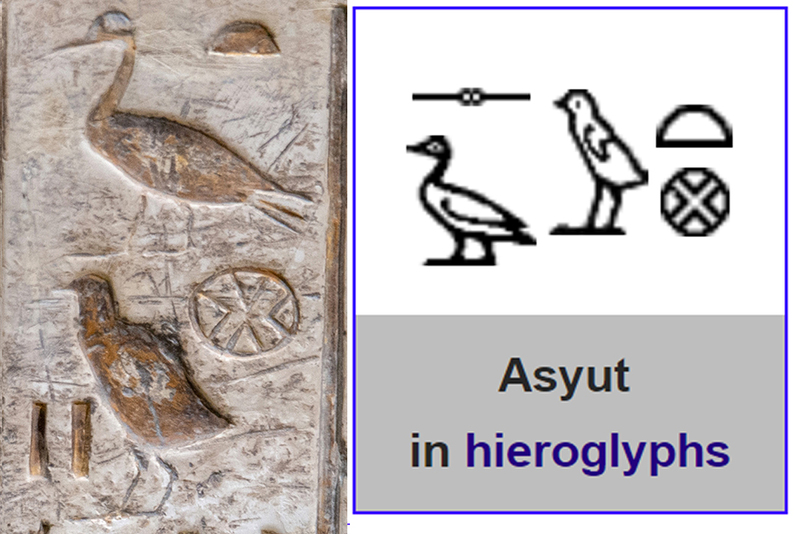 The town hieroglyphs say "Asyut"
So possibly "Hathor of Medjed" is also "Hathor-Isis" (Hethert-Aset). In the statue at the Met, Wepwawet bears a title he shares with Yinepu, "Lord of the Sacred Lands"
Dua Netjer en etj for the early examples, Neheh! To add, there is a smattering of Nubian (specifically, the Napatan end of the Kushite Kingdom) examples which long predate the influences of the Ptolemies, dating to the 800s to 300s BCE (right up before Alexander's conquest of Egypt in 332 BCE), though certainly the Ptolemaic and Roman Period examples in Lower Nubia are among the better-known and more explicit: e.g., the temple at Musawwarat es-Sufra / Ipbr-Ankh initially commissioned by the Meroitic King Arnekhamani, and the temple of Apedemak at Wad ban Naqa dating to the reign of Queen Amanishakheto. There was a lot of bleed-over from 18th and 19th Dynasty Egypt into Napatan Kushite religious expression that sometimes gets overlooked despite its obviousness (as in: Egyptian Pharaohs of those Dynasties built temples and plastered their names all over them in Lower Nubia). It's a weird dynamic, in that scholars are well aware that Egyptian influence was ubiquitous throughout Ancient Nubian history, but will then coyly quibble with it and focus more on the "shinier" examples dating to the very end of the 300s BCE and later, when our Greek and Roman buddies begin dipping their fingers into the proverbial pudding in succession. Wow, thank you so much! I'm just off to peruse the links and ponder it's meaning.